NTU provides plenty of opportunities to travel and gain experience abroad. Summer Schools are one way of travelling whilst at university and can really enhance your employability. I chose to study at Nottingham Trent University (NTU) because of the amazing atmosphere Nottingham has to offer. I also really loved the City Campus; its layout is practical and an appealing place to spend time. I also found that NTU was one of very few places to offer a Law (Sandwich) course where you do a placement year. I had also heard about all the amazing facilities NTU had to offer including a 24-hour library with a whole section dedicated to law, the mock courtrooms and the Legal Advice Centre. 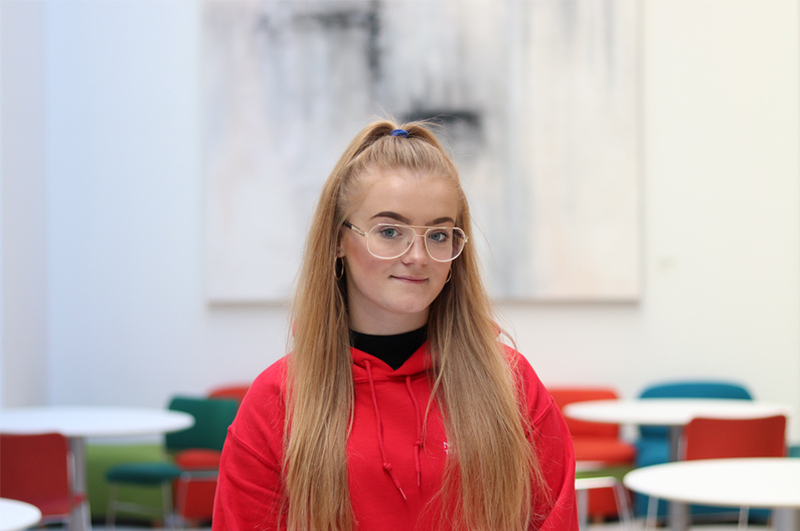 There are so many opportunities to get involved in a variety of things and I knew that by joining NTU I would not only develop academically but also build my skill set which is just as important to employers as grades. Being from Nottingham I knew I would fit in with the city and the people within it. NTU has a strong sense of community and support in place for students who need it. Welcome Week activities are a helpful way of allowing students to bond and understand what university life is all about. By taking a sandwich course, I knew that the placement year would really benefit me. The law industry is so competitive so by having a year’s work experience is a valuable asset. Being able to build rapport with staff and get a feel for what law is like in the real world is useful in terms of deciding my next steps and also building skills that I perhaps wouldn’t gain within normal university life. My decision to go to NTU was influenced by attending an Open Day. I was able to experience what university would really be like at NTU compared to other universities. Seeing the student ambassadors in the red t-shirts helped me understand the course in more detail and that there are a variety of students from a range of cultures and backgrounds. After visiting NTU I became a student ambassador and have gained some invaluable experience through this role. At the Open Day I took part in taster sessions which built on my knowledge of law from previous sessions on the pathways to law scheme, giving me a sense of how studying at NTU would be and finding out how a typical day at university would run. Having the opportunity to ask staff and students questions about my desired career and specific questions about the course was reassuring and allowed me to decide for myself if it was the right university for me. When comparing other universities on the Open Day I was quite keen for a City Campus purely because it is so simple to go into town for lunch/shopping as and when you need it. I noticed that NTU had a large amount of facilities to offer which other universities did not. Having a 24-hour library is excellent for early morning and late night study. NTU offers laptops for hire for those who don’t have their own which is also really useful. The smartcard system at NTU is a modern and simple way of hiring library books, paying for food and accessing buildings. Prior to university I took a combination of A-levels and BTECS in forensics, art and psychology. One thing I noticed about taking an A-level in psychology was the way arguments/debates are structured is very similar to that in law. After taking forensics as a BTEC, I became interested in the police side of the law. This is something I later pursued with some work experience. This year whilst studying public law we have touched on police powers and this is something I really enjoyed. Art for me was a release subject; many people will tell you studying is all about a work life balance. Although it was not directly related to law, it allowed me to express my creativity. This has been very helpful when trying to engage with an audience and looking at a given situation from more than one perspective. Prior to university, I had never studied law so for me my work experience was the key indicator as to whether law was going to be the right choice for me. Law is the basis of modern society and is involved in everyday life. This is something I find utterly fascinating and is the reason I chose to study law. There were many features that attracted me to the course. The sandwich element was appealing alongside the practical skills tied in with knowledge in year one. I also really appreciate the fact that my sandwich placement does not have to be at a law firm. This will allow me to explore a wider range of law and potentially specialise in what interests me most. As an aspiring coroner, I am very excited about the practical side of law. Next year I have chosen introduction to applied legal knowledge as my option module, which will begin to allow me to specialise towards my future career. Alongside my course, there are lots of societies to get involved in such as LEX and the mooting club. These are helpful to build your skills of the law and is something I aim to get more involved with next year. This year I have focussed on student ambassador work and temporary roles , which have been an excellent way to find my feet within the university and meet some amazing people along the way. I love that throughout your degree you can continue to specialise in your chosen path. For me family law, mooting, critical legal thinking and criminology are all options that really interest me. This will benefit me in terms of future employers and allow me to ensure I am making the right steps in the future. Legal method has been a useful topic to me as it has provided me with a great insight into the legal system and the way court procedure is carried out. Covering the topic of 'ethics' has also been useful in order to fully understand the way in which one should conduct themselves as members of society. The layout of the City Campus is something that was important to me when coming to university. With NTU growing each year there are hundreds of students in the surrounding area of the university meaning you are never alone. The NTU City Campus is all mainly on one street which is ideal, meaning everything is only a short walk apart. The Students Union (SU) building has so much to offer including a great gym, dance studio and even a climbing wall - the prices are reasonable and there is so much to get involved with through societies. The SU also has food outlets and a self-contained bar/club and plenty of areas to chill, study or work as a group. All of which really add to student life at NTU. The online learning environment (NOW) quickly becomes an essential part of your studies when you begin at NTU. Checking timetables, finding out the latest about your course and additional opportunities are all conducted through NOW. One thing I find useful on NOW is the ability to re-watch lectures. This means that if for any reason you miss a lecture you can quickly catch up or if you simply want to revise a topic, this is one of the best ways to do so. NTU provides plenty of opportunities to travel and gain experience abroad. Summer Schools are one way of travelling whilst at university and is something that can really enhance your employability. There’s lots to do in Nottingham and so much talent within the city. Nottingham encompasses both academia and creativity with local theatres having a strong sense of place. Nottingham is also a relatively cheap place to live and although it is not a huge city like London for instance, it still has a little bit of everything. Nottingham City Council host multiple events throughout the year including the Christmas market, goose fair, light night and the Nottingham beach. There is plenty for students to do in Nottingham and it is far more than just clubbing. My plans for the future are to graduate and pursue a LPC or BPTC depending where my path may lead me. I then hope to become a legal professional, however by partaking in activities such as my student ambassador work I have gained skills in an area I never thought I would and am really enjoying it. I am not restricting myself to anything at the moment but studying law opens up multiple doors and is a well worthy degree. Along the way, I’ve met some amazing people who all can offer excellent advice and expertise in a variety of areas. The employability hub at NTU are also excellent in helping with skills building, finding placements or part-time work and can often help you progress further towards your end goal. My advice to prospective students is to be organised, make the most of opportunities, and always ask questions. It does require the extra 10 minutes every night to file all your work or colour code certain parts but being organised really pays off in the end and revision will run far smoother. Opportunities are something that has helped me to excel in more than just my degree and really help improve your skills base. If you are ever unsure of anything at NTU or on your course there is plenty of support available. The student information desk in the Newton building or the Nottingham Law School reception are great for pointing you in the right direction.